No suelo tirar los cepillos de las máscaras porque me sirven para peinarme las cejas o, si alguna máscara me deja grumos, para limpiarlos. Recuerdo que me gustó tanto el cepillo que tenía, que decidí conservarlo también. Y menos mal que lo hice si no, no sé cómo sabría sacarle partido. No sé por dónde empezar pero vamos allá. 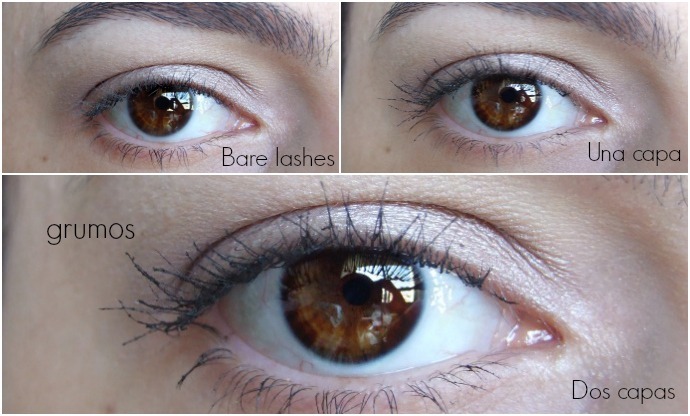 I don´t usually throw the mascara wands since I use them to brush my eyebrows or clean my lashes from clumps. 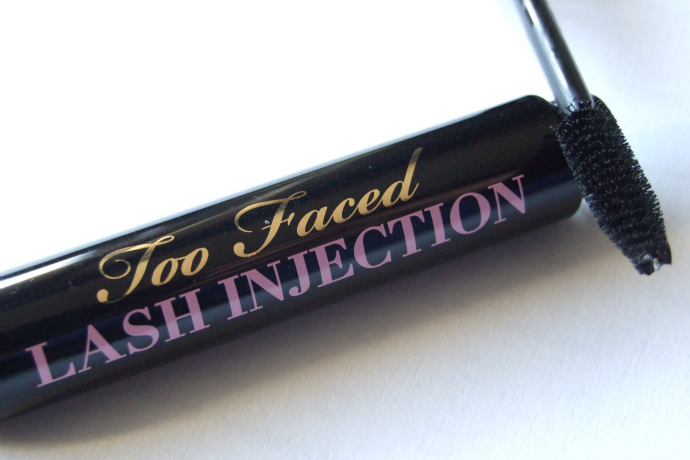 I remember I liked the Lash Injection's wand because of the shape and its comfy use. Thank goodness I kept it, I wouldn´t know how to finish this mascara otherwise. I do not know where to start the post, but here we go. Cuando abrí el bote, lo primero que me llamó la atención fue la textura. No la recordaba tan pegajosa. Pero me dije "no pasa nada, seguramente cuando te lo pongas, eso se pasará". Pues no fue así. Me puse la primera capa y se veían de tal manera mis pestañas que yo no lo llamaría "volumen" precisamente. Y luego me puse la segunda capa y terminé dándolo en las inferiores y ERROR! Cuando parpadeaba, sentía una molestia porque mis pestañas estaban pegadas las de abajo con las de arriba. Tardó en secarse una eternidad y la fórmula pegajosa no ayudaba nada. Efectivamente señoritas, han cambiado la fórmula y el cepillo (hay una diferencia enorme entre los dos). Y me parece que ha sido un gran error. When I opened it, the first thing I noticed was the texture. I didn't remember it so sticky. But I said to myself "It's fine, probably once you put it on, you will have awesome lashes." The fact is that I didn´t... I put the first coat and what I saw was not exactly "volume". Later on, I put the second coat and finished it with one coat on my lower lashes. ERROR! When I was blinking, I felt something uncomfortable because my lashes were getting stuck. It took a lot to dry and the new sticky formula did not help with that. Indeed ladies, they have changed the formula and brush (there is a huge difference between the newer and the older one). Menos mal que todavía tenía el cepillo anterior y se me ocurrió la idea de compararlos, constatando que tenían el mismo diámetro. En las fotos podéis apreciar los dos cepillos, el nuevo y el anterior. Con el nuevo tuve que separar mis pestañas porque al principio de la aplicación dejó en las raices tantos grumos que el cepillo se deslizaba, sin cepillar, y aplicar el resto del producto en las puntas. El nuevo cepillo no agarra las pestañas. Fortunately, I had the older wand because I had the idea of comparing them and found out they had the same diameter. In the photos you can see how the application looks like with both wands. With the new wand I had to separate my lashes because at the beginning of the application it got clumpy in the roots and the wand was unable to brush and grab the lashes. 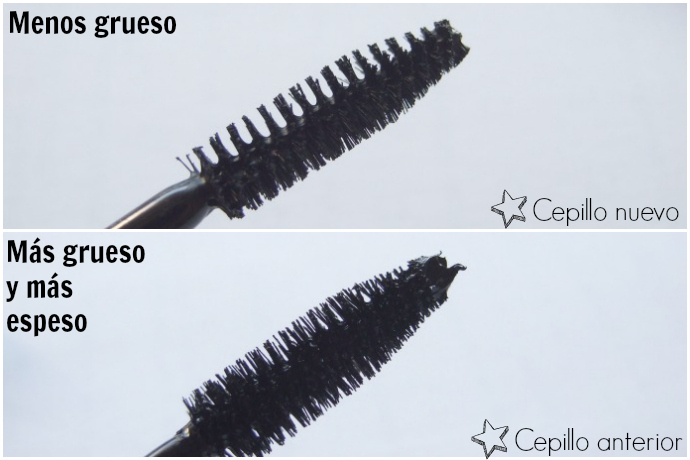 El cepillo anterior, al ser más gordo y espeso, a pesar de la textura pegajosa de la máscara, cepilló bien las pestañas y dejó un resultado más decente; con un poco más de volumen, una apariencia más espesa, etc... La voy a seguir usando con el anterior hasta que se termine. Sin embargo, el problema no termina con el cepillo ni con la fórmula. The older one, being thicker and bigger, despite of the sticky texture of the new mascara, brushed and grabbed the eyelashes in a good way and left them more decently; with a little more volume and a thicker appearance, etc ... I will continue to use the older wand until it is finished. But the problem does not end with the wand nor the formula. 1- Al pasar los dedos por las pestañas, ligeramente, se pega el producto. 3- Para probar si salían con agua, me lavé la cara y mi sorpresa fue que el producto se deslizaba de las pestañas (para que os hagáis una idea, salía en forma de pestañas, como si las pelase). 4- Seguí dando agua, y el producto se disolvió. 1 - When I passed my fingers through my eyelashes the product came out. 2 - It's not waterproof and I'm afraid it comes off easily even with sweat. 3 - To test if it came off with water, I washed my face and my surprise was that the product was coming off as it was getting peeled off. 4 - I continued to wash my face with water, and the product was dissolved. Supongo que no hay mucho más que hablar. Realmente me parece una lastima convertir un buen producto en algo así. Es más, esta máscara cuesta más de 20 euros y creedme, tengo las de drugstore y funcionan mucho mejor con mejores resultados. I guess there's nothing else to say. 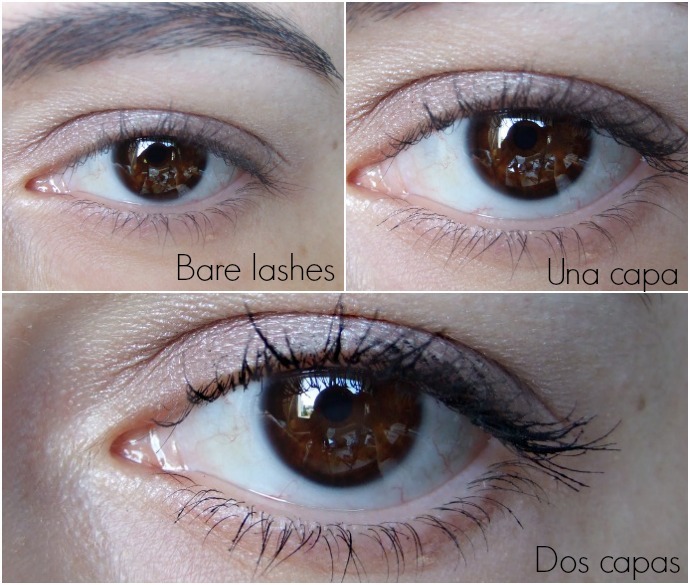 It´s a pity that they had to change everything about the mascara to turn a good product into a bad one. Bear in mind that this thing costs more than 20 euros and, believe me, I have many drugstore mascaras that work much better and provide better results than this one. Buenas, pues gracias por la info, porque era una de las máscaras que tenía pendientes de probar. Saludos! pues vaya, que pena que no funcione bien. vaya tela cielo! yo no la utilizaría!! más que nada por si se caen algunas de tus pestañas!! porque como las pega tanto...yo siempre lo digo..que no por ser más caro es mejor!! muchos besos guapa! Pues yo que tengo pocas pestañas, si encima hace esos grumos...Qué lástima! Está bien saberlo para no tirar el dinero. Menuda decepción, ¿no? Si es que a veces cambian algo en los productos (ya sea envase o fórmula) y, precisamente, estos cambios no son para bien... Menos mal que tenías el cepillito anterior.